A person will never exceed his own expectations. 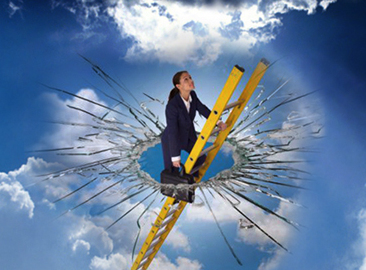 Like a "Glass Ceiling," your expectations set the limits for your life. In other words, you typically get what you expect—positive or negative. When you expand your vision, you stretch your faith. And faith is the catalyst for success. The person who expects much, receives much. He who expects little receives little. Likewise, if you expect to prevail, then you will prevail. Your belief becomes a self-fulfilling prophesy. This simple principle applies to all areas of life. If you expect a customer to buy, they usually will buy. But if you expect them to say no, then they will probably say no. Another example: If you ask someone out on a date and expect them to say no, that's usually what happens. People can sense your vibes. You project externally an energy that matches your internal emotions and attitude. A common characteristic of successful people seems to be that they carry a confident expectancy. They “assume the sale.” They see what they want coming to pass. In their mind, they have already taken ownership. Again, since we usually get what we expect, if you don’t expect much, then you won’t get much. Successful people in all areas of life exude this confident expectancy. They get a clear picture of what they want fixed firmly in their mind and then their subconscious mind pursues that goal like a heat-seeking missile. They visualize reaching the goal in their mind and visualize themselves having already achieved that goal successfully. Olympic athletes have used this principle for years. Not only do they visualize success, but they also give the image an emotional charge. In other words, they imagine how it will feel to accomplish their goal. This makes the vision real. It gives it legs. It creates an almost magical power that pulls them towards their target. And this same power is available to you. So raise your expectations and learn to visualize having already achieved your goal. Act as if you’ve already accomplished the task. Focus on your target, assume that you will hit the target and eliminate all other alternatives. Maintain a laser-focused, “tunnel-vision” as you race toward your goal. Exercise your faith. Have a “vision of victory.” Like a self-fulfilling prophecy, whatever you confidently expect usually comes to pass. So get in the habit of expecting great things from life!